You've just taken your first step on the Camino de Santiago! Our team od Expert Camino Planners will be in touch within one business day to talk you though the options so they can put together your custom Camino itinerary and pricing. In the mean time, why not Read our blog, jam-packed with tips, tools and news about the Camino de Santiago. 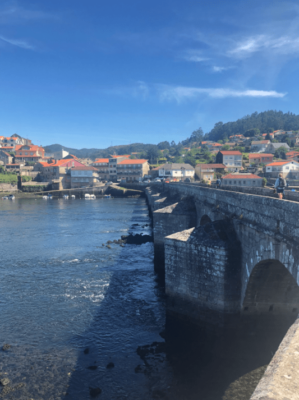 Follow The Camino consultant, Katherine Baldwin, looks back on her first Camino experience on the last 100KM of Historic Portugues Way. While planning my first Camino, I happily poured over maps and lost hours Googling small towns and hidden spots to uncover along my route. As I meticulously planned, the phrase ‘the Camino provides’ ran through my head like a steady beat, bringing rhythm to my work. I can’t even remember where I first heard this phrase, but slowly it became my Camino chant, my mantra, as I pieced together my trip. 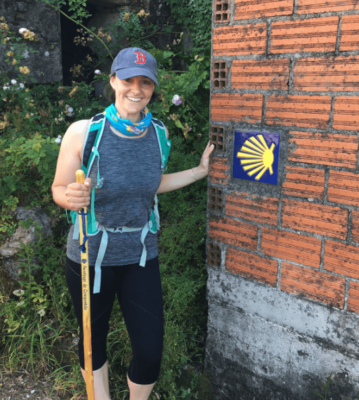 I had read so many accounts of the life-changing experiences people had on the Camino and I was all too ready for one of my own. I was convinced of the revelations I would have while walking, the insights I would gain, and how I would likely get to share all my new found wisdom with Martin Sheen himself (who I would casually stumble into while he was filming ‘The Way 2’) over a glass of vino tinto, because – the Camino provides. However, as you can imagine, this was not exactly how my Camino unfolded. Despite a few mishaps, an injured foot, and still no closer to solving world peace, I made it to Santiago a happy and weary pilgrim. 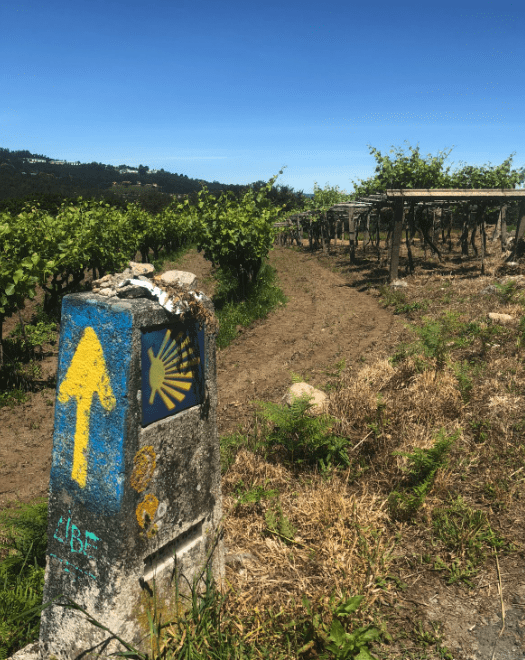 The Camino hadn’t provided me with what I expected, but it provided what I needed – a chance to slow down, to appreciate, and to enjoy being where my feet are. I have developed a reputation amongst my friends and family for routinely attempting to ignore the limits of space and time and packing as much as possible into a day. Planning my Camino was no different, I was ready to experience all that I could over the course of one week. 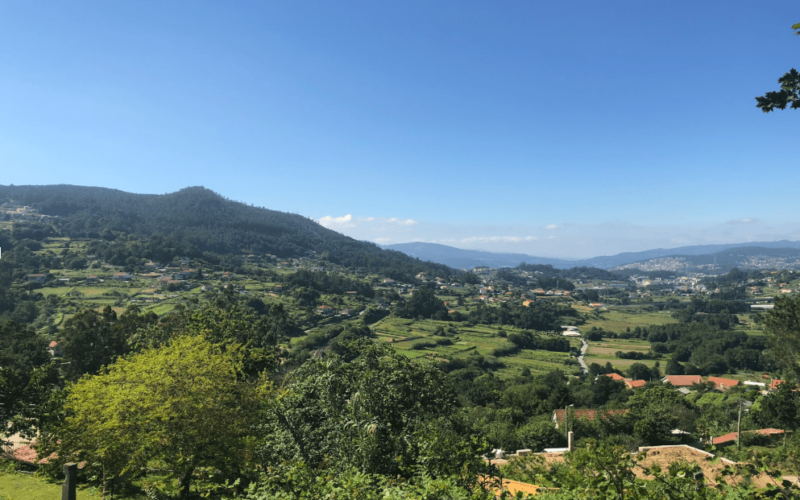 I chose the last 100km of the Portuguese Way, from Tui to Santiago, for my first Camino because it is a quieter route, weaving through vineyards, small villages, and woodlands. The route traverses the Albarino wine region, promising local wines and good food, pairing nicely with the route’s interesting history. Deciding to complete the route in 5 walking days, necessitating a long first day of 32km, allowed us an extra day in Santiago to relax and enjoy our end destination. Before even beginning our first walking day, my walking partner and I excitedly ran around medieval Tui – visiting the cathedral, marveling at our ‘cafe con leche’, and already purchasing yellow arrow souvenirs from Tui’s unique pilgrim store (so grateful for luggage transfer!). When we finally began walking, we were immediately struck by the pleasantness of the route, with every back garden seeming to have its own display of perfectly photogenic grape vines. Along the way, we stopped at a small backyard cafe for lemonade and enjoyed a massive ‘bocadillo’ sandwich in O Porrino for lunch. Languishing a little too long in O Porrino, combined with our late start, caused us to pick up the pace for the second half of our walking day. We were rewarded with beautiful evening light as we paused to enjoy hilltop views before our descent into Redondela. The next morning, the history of the Portuguese Way was impressed upon us as we crossed the Roman bridge out of Arcade. One of my favorite aspects of this route is how many interesting little churches and religious monuments stand unassumingly in the landscape which, upon closer inspection, have been standing there for centuries. However, a nagging pain in my walking partner’s foot reached a crescendo as we reached Pontevedra, the destination for our second walking day. Hoping for a Camino miracle, we activated Project RICE – Rest, Ice, Compression, Elevation – to no avail. I was forced to face the crushing realization that walking was not in the cards for the following day. Instead, we spent the day hobbling to different pharmacies and, through comical exchanges of high school Spanish, stocking up on supplies before hailing a taxi to our next hotel in Caldas de Reis. Surprisingly, this quaint little town turned out to be my favorite of the trip. I ended up being grateful for extra time to explore the village, discovering the best bakery and a thermal fountain believed to have healing powers (I, of course, insisted my partner take a dip). Since we are Anthony Bourdain wannabes, that evening we identified a great restaurant nestled next to the river in town and had so much fun eating and drinking local wine – served in bowls! The following morning, I sheepishly left my partner behind and walked into Padron on my own. As I walked through fields and forests, I was pleasantly surprised at how enjoyable it was to walk by myself. I chatted to other pilgrims, and said hello to a few Camino pooches, but found myself happy to fall back from the groups to spend more time with my own thoughts and take in the scenery. When I reached Padron, I joined my partner on the patio of our hotel where we had the happiest, most relaxing afternoon sipping Estrellas, reading about Padron’s famous poet, Rosalia de Castro, and talking and laughing without any agenda or anywhere to be except where we were. It is one of my best memories of the trip and one of my favorite memories in general. On our final walking day, my partner was determined to reach Santiago on foot (cue Deniece Williams’ ‘Let’s Hear It For the Boy’) and we set off into one of the hottest days of our trip. This final day involves a good bit of road walking as you approach the city, made slightly more uncomfortable in the summer heat. Eager to reach the city, we decided not to stop for a sandwich at a little cafe about an hour away from the Cathedral. My advice to fellow pilgrims – always stop for the sandwich! As we approached the heart of Santiago, our hunger took over and we realized that the Cathedral will still be there in an hour and we’ll be much happier to see it with full stomachs. 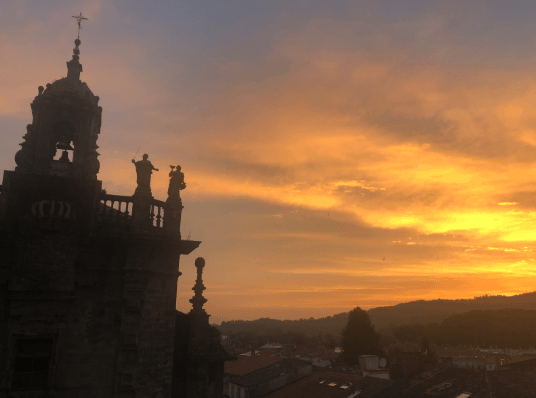 Sunset from Praza do Obradoiro in Santiago. After enjoying one of the most satisfying bocadillos of my young life, we finally reach the Cathedral of Santiago de Compostela. I can honestly say it was an incredibly moving, emotional experience standing in the square watching other pilgrims arrive and embrace. We ended up returning to the square each evening at sunset to revere in the atmosphere a little longer. In the end, my first Camino didn’t quite go as planned and I’m so grateful. I learned much more about what it means to slow down and stay present, letting events unfold naturally rather than forcing an outcome. I found that not only does the Camino provide, but it surprises as well. I look forward to completing many other routes, and while I will probably still overplan, now I know I will also be able to appreciate and enjoy all the experiences that come my way. Learn more about the Portugues Way and our other Camino tours here. Need help planning your Camino? Talk to the experts! Follow the Camino is Licenced and bonded by the Commission for Aviation Regulation, TA 0785.